There is no question surgery can be dangerous. Doctors often have to do a lot of complex things. To use a sports analogy, surgeons often have to make a lot of difficult diving catches for a surgery to be successful. Continuing the sports analogy, getting the surgical position right generally not a diving catch but an easy pop fly surgery. Prior to operating, surgeons, nurses, and anesthesiologists need to ensure that a patient is positioned properly. If the doctors fail to meet the responsibility, the result can be pain, lifelong injury, and even death. Common injuries include pressure sores, brachial plexus injuries, spinal cord, damage to key organs from lack of oxygen and lumbosacral nerve root injuries. These claims usually are brought against the anesthesiologist. The surgeon may or may not be named as a defendant, depending on the facts of the case. Every member of the surgery team can see the surgical site. The surgeon has the best access to the site. The anesthesiologist has proper access to administer anesthesia. The position minimizes the risk of nerve damage, bleeding, pain, and respiratory/circulatory issues. Notwithstanding the “easy fly ball” metaphor, proper positioning is not “one size fits all.” Depending on the height, weight, health, and condition of the patient, a surgeon might have to make a judgment call on how to position the patient. Plus, if a patient has circulatory conditions or diabetes, they may require the use of certain tools or padding to avoid further complications. Patients coming out of surgery can feel pain in areas that were not associated with the surgery site. This usually stems from stretched nerves or muscles that result from improper surgical positioning. While pain caused by improper positioning may be temporary, prolonged stress can actually result in trauma to nerves and muscles. There have also been instances of hypertension and circulation issues due to positioning. When a surgeon places a patient in a position that requires one part of their body to be higher than another, blood pressure readings can be inconsistent across the body, leading to these complications. 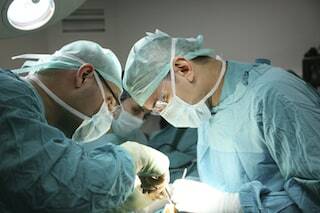 If a member of a surgical team places a patient in an incorrect position that results in injury, the patient may be able to seek compensation. Most meritorious positioning lawsuits are never filed because the patient or the family never fully understands that positioning is what caused the injury or death. So many of these cases are swept under the rug and never see the light of day because the families never even expect negligence. More than most cases, these claims also require a high level of honestly in the medical records to figure out what actually happened. This also leads to less overall lawsuits in these cases. These cases, like all malpractice claims in Maryland, require the testimony of a medical expert on behalf of the victim who will testify that the doctor breached the standard of care causing an injury or death. Below are a limited sampling of jury verdicts and settlements in surgical positioning cases. One thing is for sure: not a lot of these cases go to trial. These cases are for informational purposes only. It is very hard to approximately the value of these cases based on these results. Every jury and every case is different. 2013, Maryland: $4,750,000 Settlement: Doctors are performing spinal surgery on a toddler and failed to apprise themselves of his motor activity throughout the surgery. When the toddler wakes up from the surgery, he is a quadriplegic. His family sues, alleging that the doctors placed the toddler in an incorrect position that (among other actions) caused his paralysis. Prior to trial, they settled for $4,750,000. 2013, Nevada: $1,361,288 Verdict: When doctors are about to operate on a woman, she suddenly falls off the table. She was put in a position with her head down and her feet elevated, and when she falls, she suffers a bulging disc. She feels unusual pain immediately upon waking up. She then sues the hospital, alleging that they lied to her about the injury. The jury awarded her $1,361,288. 2007, New York: $750,000 Verdict: A woman presents to a plastic surgeon for a breast augmentation. When she wakes up from the procedure, she loses motion in her right arm. She sues the surgeon claiming that the best explanation is improper positioning during surgery. The jury awards her a verdict of $750,000 after she explained that the injury only permits her to use one hand. Miller & Zois has successfully represented numerous individuals in medical malpractice litigation and has the skills and knowledge, resources and experience to stand up to these doctors when they make mistakes. Call us at 800-553-8082 or get a free online consultation.